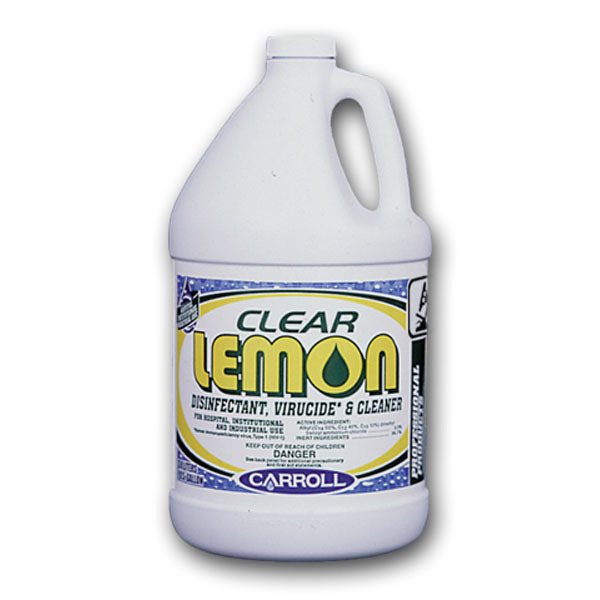 Neutral cleaning and disinfecting can be accomplished with this lemon fresh product. This product is a quat based ammoniumÂ disinfectant that is effective against bacteria including Salmonella Choleraesuis, Pseudomonas Aeruginosa and StaphylococcusÂ Aureus on hard surfaces. It is also effective against the HIV-1 (AIDS) Virus. Â Clear Lemon is formulated to clean and disinfect while leaving a fresh, deodorizing, lemon fragrance. Ideal for use in virtually all institutional or commercial sanitation programs for the control of disease and odor causing germs. It may be used on virtually allÂ washable surfaces such as porcelain, tile, enamel, metal, resilient floors, laminates and painted surfaces. It will not dull or removeÂ detergent resistant floor finishes or waxes.